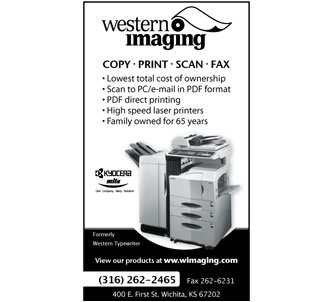 Western Imaging is a full service office equipment dealer specializing in mono or full-color multi-functional copiers, high-speed laser printers, scanners and facsimile. Western has been locally owned and operated for 69 years in downtown Wichita. Today Western Imaging offers the latest document management equipment with complete sales and service. Our products successfully provide a reduction in frequency of part replacements and have reduced the number of disposable items. The result is lower total costs to you and a cleaner environment.